This past weekend saw the Garnet take to the Tarble Pavilion court for likely the last time this season as they played host to the Centennial Conference Championship tournament. They ultimately fell in a bitterly contested final at the hands of Johns Hopkins. Action began on Friday evening as Johns Hopkins played Franklin and Marshall in the first of the semifinals, with Hopkins pulling out a tough 50-49 win over the Diplomats, the second one possession loss in a week for the Diplomats at the Tarble Pavilion. Swarthmore had beaten them 58-56 earlier in the week to secure the hosting rights for the Centennial Conference Tournament. The second game of the night saw Swarthmore taking on the Ursinus College Bears, who had beaten Dickinson in the tournament play-in game earlier in the week. 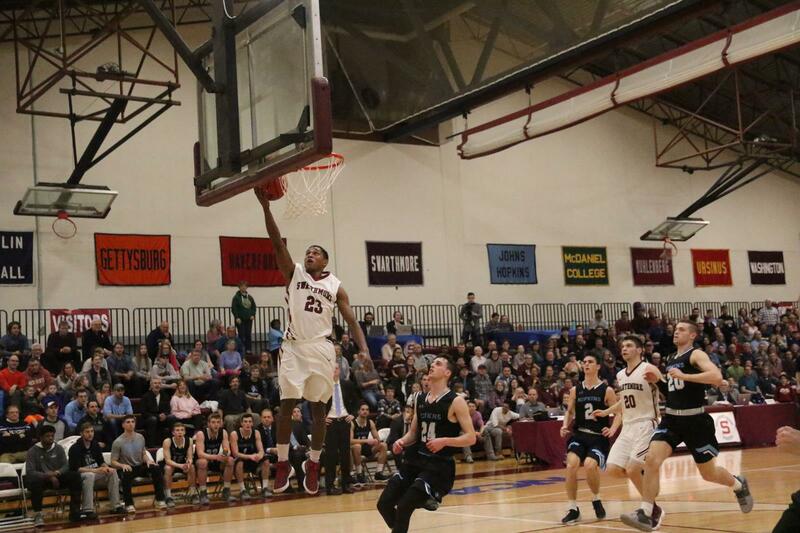 The drama in that game began even before the opening tip, as Zac O’Dell ’20 broke the rim with a thunderous two-handed slam during warm-ups. Thankfully, there were spare parts on hand and the rim was fixed in short order. The Garnet surrendered the first basket of the game but never looked back after that, eventually breaking the game open in the latter part of the second half to secure a 68-49 win over the Bears. At some points the game turned into the Cam Wiley show as the junior guard showed off the speed and aggression that led to him being named an All-American and Centennial Conference MVP last season. Wiley scored 23 on 10-17 shooting, and he was able to effortlessly drive to the rim all night, in addition to showing off an indefensible floater. His performance put him just 32 points of crossing the 1,000-point threshold; impressive given how he had only played in 14 games off the bench as a freshman. He also grabbed six rebounds and dished out three assists in an impressive all-around performance. Chants of “MVP” rang out through a packed student section on every touch by Wiley. Swarthmore’s trio of big men also performed admirably in the game, helping to hold Ursinus to only a 29.8 field goal percentage, and out-rebounding the Bears 44 to 32. Nate Shafer ’20 was in double figures for both points and rebounds as he recorded his fifth double-double of the season. 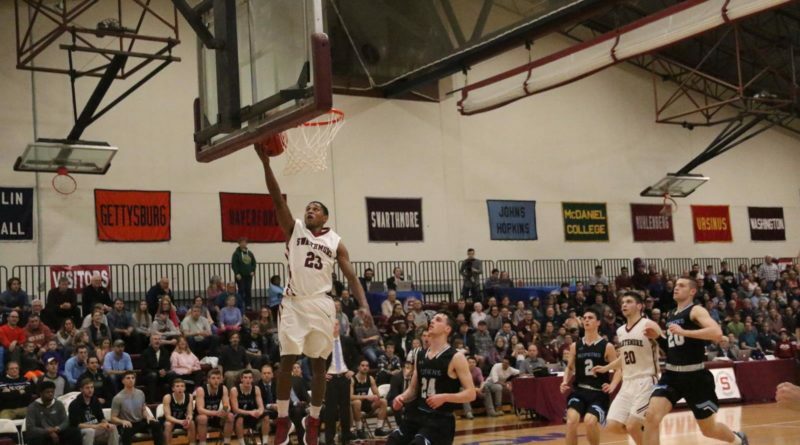 O’Dell also added 11 points while Robbie Walsh ’18 chipped in with nine points and seven boards. The one troubling statistic from the game was the Garnet’s cold shooting from the charity stripe, as they only converted eight of their 19 free throw attempts. This was a sign of things to come in the Conference Championship game against Johns Hopkins. The Garnet faced off against the Blue Jays of Hopkins on Saturday night, looking to bring a second straight Centennial Conference Men’s Basketball Championship trophy to Tarble Pavilion, and likely secure the hosting rights to the first weekend of the NCAA tournament. Swarthmore had previously beaten Johns Hopkins at Tarble Pavilion during the regular season, but lost a double overtime heartbreaker in Baltimore only a few weeks prior to this game. The game was a closely fought defensive battle throughout as both teams played deep into the shot clock. Near the end of the first half, it looked like the Garnet were beginning to break things open as they went on a 7-2 run to enter the half up nine in front of a boisterous home crowd of over 1,000 people. However, it was Hopkins that came out of the locker room firing. During one four-minute run early in the second, the Garnet were held without a field goal while the Blue Jays went on a 9-0 run, giving them their first lead of the game up 41-39. The teams traded baskets back and forth until Hopkins found themselves up by six with only three minutes left to play. The Garnet managed to claw back into it as a Shafer block and Wiley drive in transition cut the deficit to two with just over a minute to play. The Garnet at that point were forced to start intentionally fouling and eventually sent Michael Gardner to the line, where he converted both shots of a one-on-one to push the lead to four. Wiley once again quickly drove to the basket and converted the lay-up, and the Garnet were again forced to foul on the inbounds, sending Gardner back to the line, where he once again hit both of his shots, and sent the lead back to four points. Wiley was fouled on his next drive, and managed to convert a pair of clutch free throws to once again cut the lead to two points. But again, it was Gardner to be fouled on the inbounds, and Gardner again to drive the dagger into the Garnet’s heart with his third straight converted one-and-one to put the Blue Jays up four with only eight seconds left. Wiley once again flew down the court and released an NBA-range three, only to see it fall just wide. Zack Yonda ’18 managed to grab the rebound, but couldn’t convert the shot from close range, and the Blue Jays managed to grab the loose ball to kill the clock, securing for themselves Centennial Conference’s automatic bid to the NCAA tournament. Gardner was named MVP of the tournament, likely helped by his clutch free throw shooting to help secure Hopkins the win. It was also the first win at Tarble Pavilion as a coach for Blue Jays head coach and Garnet basketball alum Josh Loeffler ’03. Cam Wiley was once again impressive, scoring 20 points and showing his ability to score at will when it was needed. But it was the cold free throw shooting in part that doomed the Garnet, as they only connected on seven of their 13 attempts. However, the Garnet still qualified for the NCAA tournament on the strength of their 22-5 record, and they will travel up I-95 on Friday to Wesleyan University to face off against New England College in the first round.